Given that firms’ overseas activities through foreign direct investment (FDI) have been expanding over the last several decades (Urata and Kawai 2000), numerous studies have examined the determinants of FDI (Head and Ries 2003, Kimura and Kiyota 2006, Todo 2011), as well as its economic implications, such as what kinds of economic gains parent firms obtain from FDI (Federico and Minerva 2008, Todo and Shimizutani 2008, Yamashita and Fukao 2010, Hijzen et al. 2011), and what kinds of economic gains are obtained by firms located in host countries (Todo 2006). Apart from these economic implications of FDI, economists have also been interested in the determinants of ‘successful investments’ in terms of, for example, foreign subsidiary performance. This reflects the obvious need for practitioners and policymakers to understand what governs the success of foreign subsidiaries in host countries. Despite this strong motivation, however, mainly due to the lack of data availability, the understanding on the background mechanism leading to better performance of foreign subsidiaries is far less than comprehensive. We should recall that some studies specifically examining the profitability and productivity of foreign subsidiaries (e.g. Belderbos et al. 2008, Sakakibara and Yamawaki 2008, Ito and Fukao 2010) have reported that various attributes associated with foreign subsidiaries such as size, age, and the degree of local procurement matter for the profitability of local subsidiaries. On the one hand, these studies have certainly clarified how the attributes of foreign subsidiaries and the economic conditions associated with host countries lead to better performance of subsidiaries. On the other hand, studies have not succeeded in producing an extensive analysis on the contribution of resources provided by parent firms to the business activities of their subsidiaries. Notably, some of the above-mentioned studies have pointed out that under some specific conditions, parent firms’ research and development (R&D) activities contribute to their foreign subsidiary profit. However, such R&D activities done by parent firms might be only a part of resources transferred from them. Suppose a Japanese manufacturing enterprise opens up a foreign plant. While the plant could be largely managed by the local staff, it is natural to assume that its parent firm located in Japan contributes to its operations in various dimensions including not only R&D but also administrative work, advertising, and training. In other words, it would be highly possible that not only the local resources and parent firms’ R&D activities, but also various resources accumulated domestically in their parent firms could contribute to the operation of foreign subsidiaries as important inputs. To the best of our knowledge, how such resources provided by parent firms could contribute to subsidiary activities and performance is still an open question. Against this backdrop, in a new paper we empirically examine the above-mentioned conjecture and expanded the discussion on the determinants of foreign subsidiary activities and performance (Hosono et al. 2017). We employ a large set of linked subsidiary-parent data for the period 2000-2013 accounting for 3,800 Japanese parent firms and their 20,000 overseas subsidiaries to estimate the subsidiary-level production function. Note that, rather than employing the profit (e.g. Sakakibara and Yamawaki 2008, Ito and Fukao 2010) or productivity (e.g. Belderbos et al. 2008) of subsidiaries as the outcome variable as observed in previous studies, we examine the production function so that we can explicitly identify the contribution of various inputs to subsidiary production and operations. Our data include information on physical inputs (i.e. capital and labour) of subsidiaries and parent firms, as well as other information required for calculating subsidiary-level value added as output and measuring intangibles held by parent firms. All of this information helps us to precisely measure the inputs both in subsidiary- and parent firm-level and the subsidiary output, which is one distinguished feature of the present study (Figure 1). Note that the point raised in our paper is closely related to the classical debate on why foreign-owned firms perform well compared to their domestically owned counterparts. While the literature has pointed out that the inherent large size of foreign-owned firms (Lipsey and Sjoholm 2004) and obvious selection effects (Andrews et al. 2009) can partly explain their better performance, another group of studies has suggested that potential omitted variables associated with the resources provided by parent firms might cause upward bias in the estimates of FDI return. For example, Bridgman (2014) claims that omitting the inputs from the side of parent firms and estimating the return of FDI by using only subsidiary-level information leads to substantial upward bias to the return. 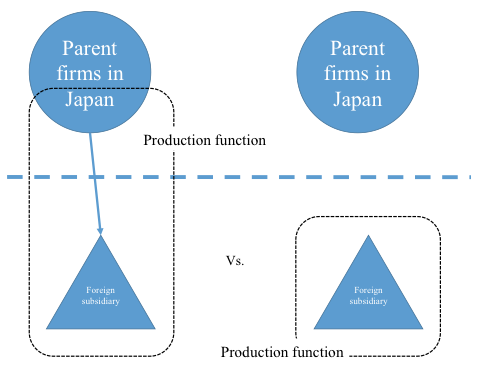 Although we do not intend to explicitly compare foreign-owned with domestically owned firms but instead make a comparison among foreign-owned firms holding access to various resources of their (Japanese) parent firms, our analysis could be helpful in quantifying the impact of omitting important inputs in the production function estimation. We should also note that resource provision and spillover from related parties such as nearby firms (Koenig et al. 2010) and transaction partners (Inui et al. 2015) have been one important research topic in the international trade literature. Thus, we aim at also contributing to this ongoing discussion on the scope of firms’ operations by explicitly taking into account parent firms. Our results are summarised as follows. First, we found a positive contribution from parent firms’ intangibles accumulated domestically to their foreign subsidiary production. This result is obtained from the estimation properly controlling for subsidiary-level fixed effects. Thus, we are confident that the time-series variation of value added within each subsidiary has a strong relationship with the dynamics of parent firms’ intangibles over time. Furthermore, the result is confirmed even after controlling for the number of overseas subsidiaries held by parent firms as one additional explanatory variable. This implies that even under the environment where a parent firm holds a large number of overseas subsidiaries, the intangibles accumulated in the parent firm still contribute to subsidiary production on average. Second, we found that the contribution is stronger in the case of smaller subsidiaries. This result implies that while the contribution from parent intangibles is significant even after controlling for various factors as mentioned above, there are some cases that enhance the contribution. Third, such a positive contribution from parent firms’ intangibles to subsidiaries’ production is confirmed for most of the subsidiary locations. These results jointly suggest that intangibles contribute to firm activities even when those are geographically remote. Andrews, M., L. Bellmann, T. Schank, and R. Upward. 2009. “The Takeover and Selection Effects of Foreign-Owned Establishments: And Analysis using Linked Employer-Employee Data,” Review of World Economics 145: 293-317. Belderbos, R., B. Ito, and R. Wakasugi. 2008. “Intra-Firm Technology Transfer and R&D in Foreign Affiliates: Substitutes or Complements? Evidence from Japanese Multinational Firms,” Journal of the Japanese and International Economies 22: 310-319. Bridgman, B. 2014. “Do intangible assets explain high U.S. foreign direct investment returns?” Journal of Macroeconomics 40: 159-171. Federico, S and G. A. Minerva. 2008. “Outward FDI and Local Employment Growth,” Review of World Economics 144: 295-324. Head, K. and J. Ries. 2003. “Heterogeneity and the FDI versus Export Decision of Japanese Manufacturers,” Journal of the Japanese and International Economies 17: 448-467. Hijzen, A., S. Jean., and T. Mayer. 2011. “The Effects at Home of Initiating Production Abroad: Evidence from Matched French Firms,” Review of World Economics 147: 457-483. Hosono, K., D. Miyakawa, and M. Takizawa. 2017. “Do Overseas Subsidiaries Benefit from Parent Firms’ Intangibles?” RIETI Discussion Paper Series 17-E-073. Inui,T., Ito, K., and D. Miyakawa. 2015. “Overseas Market Information and Firms’ Export Decisions,” Economic Inquiry 53: 1671-1688. Ito, K. and K. Fukao. 2010. “Determinants of the Profitability of Japanese Manufacturing Affiliates in China and other Regions: Does Localization of Procurement, Sales and Management Matter?” The World Economy 33: 1639-1671. Kimura, F. and K. Kiyota. 2006. “Exports, FDI, and Productivity: Dynamic Evidence from Japanese Firms,” Review of World Economics 142: 695-719. Koenig, P., F. Mayneris, and S. Poncet. 2010. “Local Export Spillovers in France,” European Economic Review 54: 622-641. Lipsey, R. E. and F. Sjoholm. 2004 “Foreign Direct Investment, Education and Wages in Indonesian Manufacturing,” Journal of Development Economics 73: 415-422. Sakakibara, M. and H. Yamawaki. 2008. “What Determines the Profitability of Foreign Direct Investment? A Subsidiary-Level Analysis of Japanese Multinationals,” Managerial and Decision Economics 29: 277-292. Todo, Y. 2006. “Knowledge Spillover from Foreign Direct Investment in R&D: Evidence from Japanese Firm-Level Data,” Journal of Asian Economics 17: 996-1013. Todo, Y. 2011. “Quantitative Evaluation of the Determinants of Exports and FDI: Firm-Level Evidence from Japan,” The World Economy 34: 355-381. Todo, Y. and S. Shimizutani. 2008. “Overseas R&D Activities and Home Productivity Growth: Evidence from Japanese Firm-Level Data,” Journal of Industrial Economics 56: 752-777. Urata, S. and H. Kawai. 2000. “Intrafirm Technology Transfer by Japanese Manufacturing Firms in Asia,” in The Role of Foreign Direct Investment in East Asian Economic Development, NBER-EASE Volume 9, 2000: 49-77. Yamashita, N. and K. Fukao. 2010. “Expansion Abroad and Jobs at Home: Evidence from Japanese Multinational Enterprises,” Japan and the World Economy 22: 88-97.